You might be mistaken for thinking, with a massive trade show taking place in just a few days time, that camera companies might save some news for Monday. Instead, Canon has revealed yet another new camera ahead of Photokina 2018: the PowerShot SX70 HS. The designers deserve a pat on the back, as the SX70 HS makes quite an impression with its stylish DSLR looks. And under the hood it’s packing a surprising amount of firepower that may even turn the heads of a few DSLR snobs. As you’d expect of a bridge, it has an impressive focal range. Its 65x zoom lens gives an equivalent of 21-1365mm in 35mm terms, with a variable aperture of f/3.4-6.5. What might surprise you, however, is that it also boasts a 20.3MP CMOS sensor along with a DIGIC 8 processor – the very same chip that powers the recently revealed Canon EOS R mirrorless monster. Indeed, it even outdoes the EOS R in that it has in-body image stabilisation, in the form of Intelligent IS with Dual Sensing IS plus 5-axis Advanced Dynamic IS. The DIGIC 8 processor enables the Canon PowerShot HS to deliver a 10fps continuous shooting speed, along with 4K video – including 4K time-lapse and 4K frame grabs. While its 7.5cm 922,000-dot LCD screen isn’t touch-enabled, it is fully articulated – obviously a massive bonus for general purpose shooting as well as videos and vlogging. It also boasts quite an impressive 2.36 million-doat electronic viewfinder. With built-in Wi-Fi and Bluetooth connectivity, it supports the Canon Camera Connect app to enable quick and simple file transfer as well as Remote Live View shooting. In all, it’s a very appealing package – and at a very appealing price. 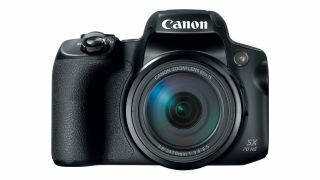 The Canon PowerShot SX70 HS will retail for £519.99 from November 2018.